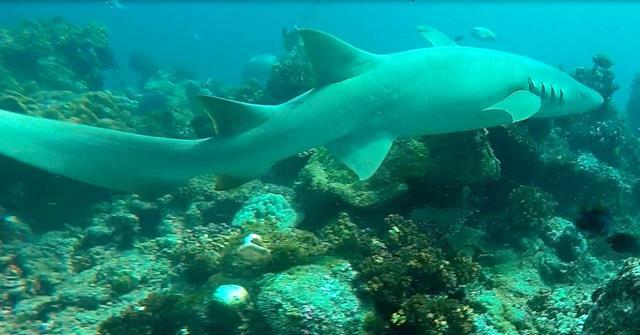 During my recent trip to Fiji, we went on shark dives with 3 dive centres, and saw a great variety of the sharks of Fiji. Apart from the more common whitetip and blacktip reef sharks, we also saw sicklefin lemon sharks, tawny nurse sharks, bull sharks, and more! 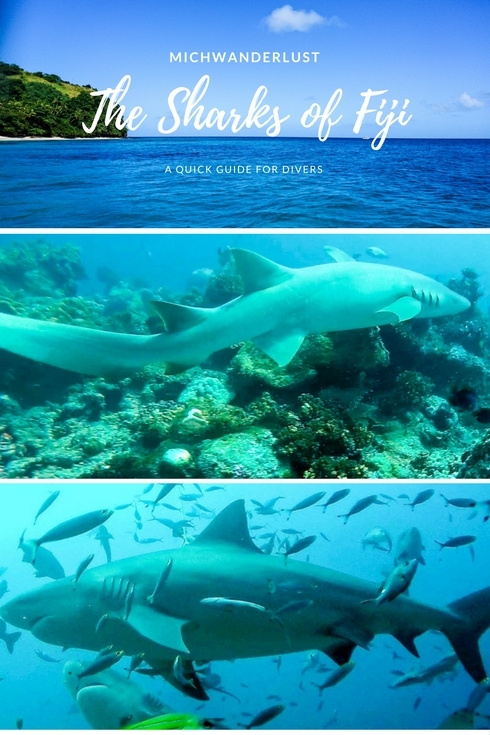 This is a quick guide to these different types of sharks and my experience with the dive centres. I just need to acknowledge the elephant in the room first. 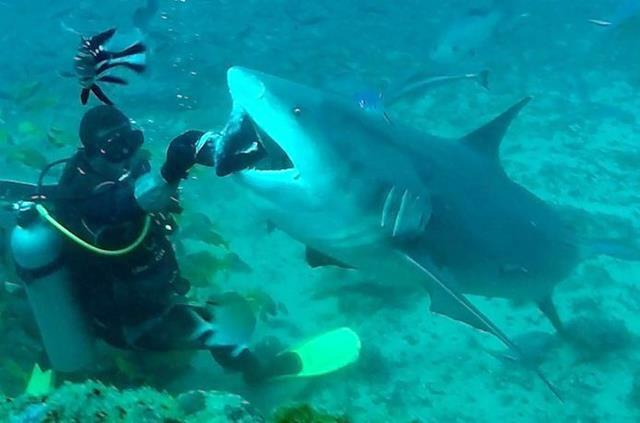 As I mentioned previously, shark dives are controversial. I personally think if done right, they do more good than harm. You’re naturally free to disagree, and I welcome discussion. My only request is that you check out my reasoning in the link above before jumping in. 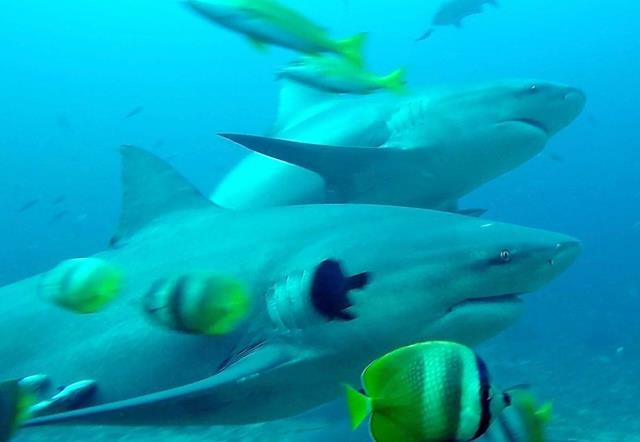 This post is just about the sharks of Fiji, and doesn’t go into detail on why I support shark dives when done right. We saw 5 species with Aqua-trek, mostly lemon sharks and tawny nurse sharks. They grow up to 3.8m (12 ft) long, but typically don’t exceed 3.1m (10 ft). See what I mean about the permanent smile? a pair of barbels in front of the nostrils (like goatfish). Tawny nurse sharks grow up to 3.2m (10 ft). As the name suggests, they have a distinctive white tip on all fins. 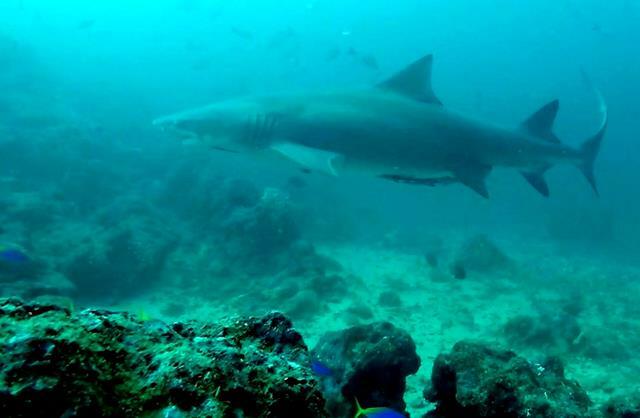 Confused with the more common whitetip reef shark? Here’s how to tell them apart: the latter only have white tips on their dorsal and caudal (tail) fins, and are much smaller. Silvertips are usually between 2 – 2.5m (6.6 – 8.2ft). I like the hand signal for this shark: you rub your fingers together, as in “money”. We saw a lot more with Beqa Adventure Divers, but we saw 2 here. More about them below! There’s always a ton of smaller fish hanging around, hoping to get some scraps. It’s interesting how quickly they all dart out of the way when a bigger shark appears, though! Price: USD160 for 2 dives. The shark dive here is organised slightly differently. 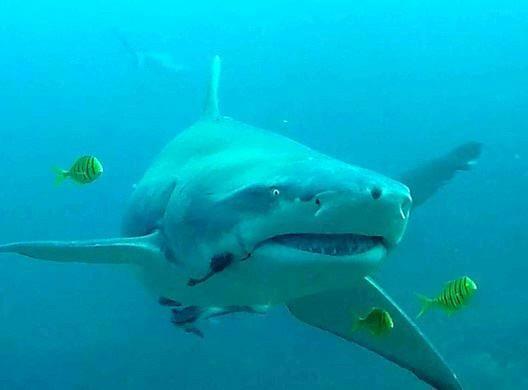 You may have heard of bull sharks before, as they have a reputation for being aggressive and unpredictable. Here, though, they completely ignored us. It was an incredible experience to be surrounded (and ignored) by 15 of these magnificent creatures! 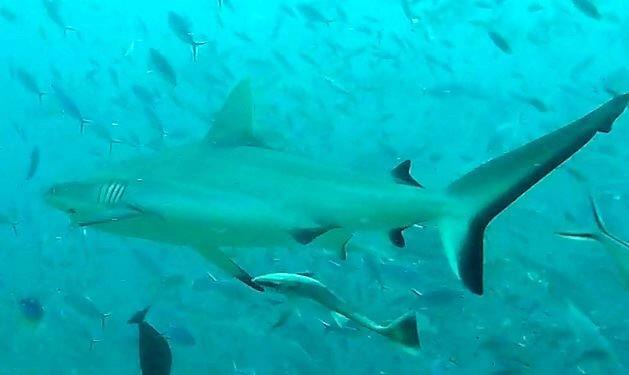 I heard that as many as 40 bull sharks come during peak season. I can’t even imagine! They grow up to 3.5m (11ft) but average about 2.4m (7.9ft) for females; the males are slightly smaller. This is the highlight of the dive. 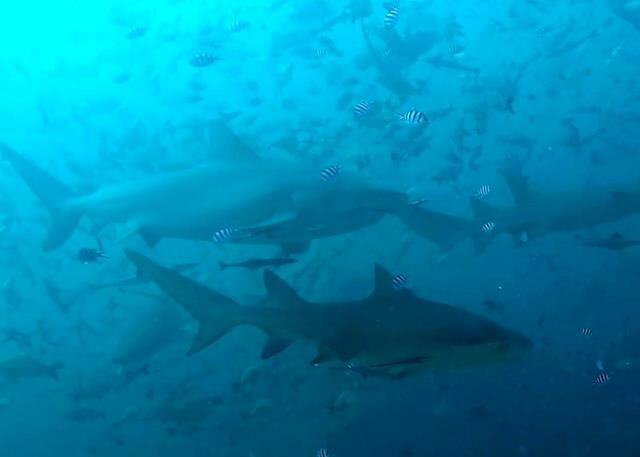 Where else would you be able to see so many bull sharks at once?? 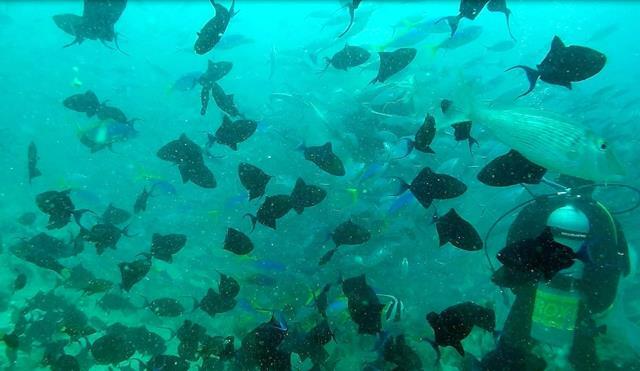 After that, you ascend to 10m where they feed grey reef sharks and whitetip reef sharks. 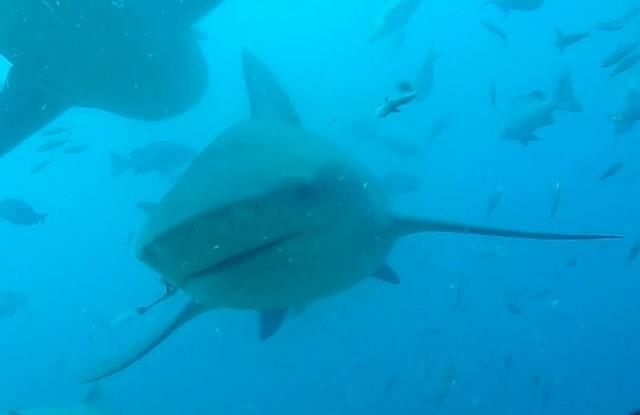 This is to avoid the bull sharks shutting out the smaller sharks, as bull sharks typically stay deeper. They are typically less than 1.9m (6.2ft) long – so, in terms of size, smaller than silvertips but larger than whitetips or blacktips. 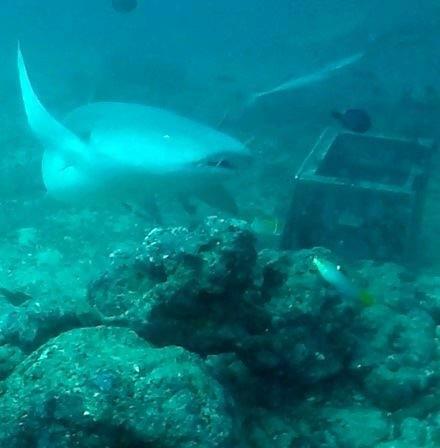 These small sharks (usually not exceeding 1.6m) swarmed around the feeders like excited puppies! It was very endearing. Their distinguishing feature is the white-tipped dorsal fin. 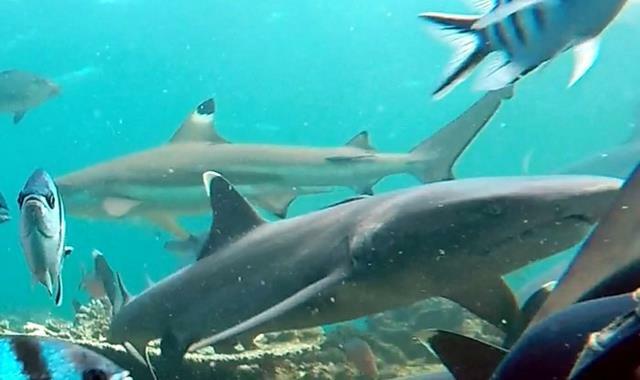 The whitetip reef shark below is totally side-eyeing us, isn’t it? 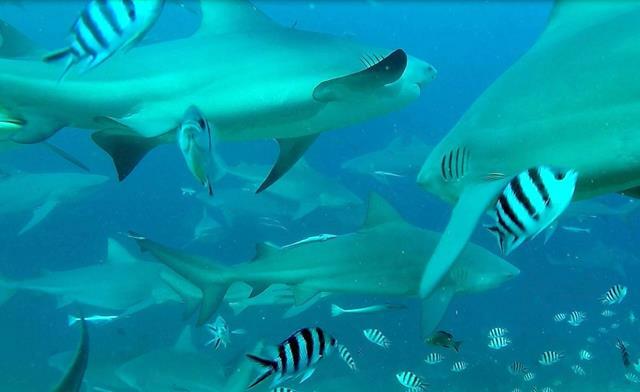 Finally, at the safety stop (about 4m) they feed whitetip reef sharks and blacktip reef sharks. 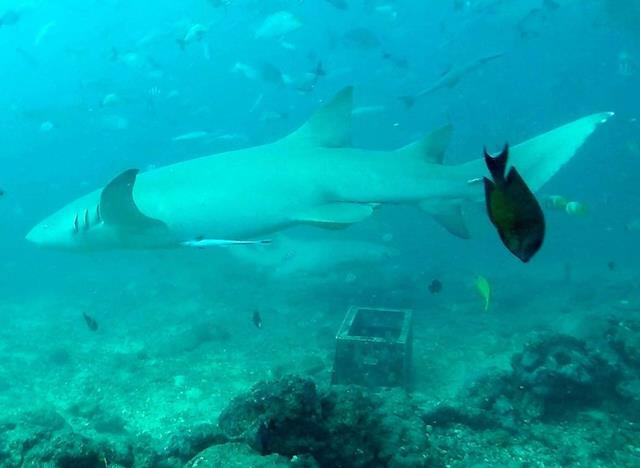 Below: a whitetip in the foreground; a blacktip at the back. Check out the photo-bombing fish! Easily distinguished by the prominent black tips on their fins (with a rim of white below the black tip). They are about the same size as whitetips. Price: FJD325 (about USD160) for 2 dives. While all the dive centres we visited seem to be quite keen on conservation, I want to make special mention of BAD’s efforts in this regard. 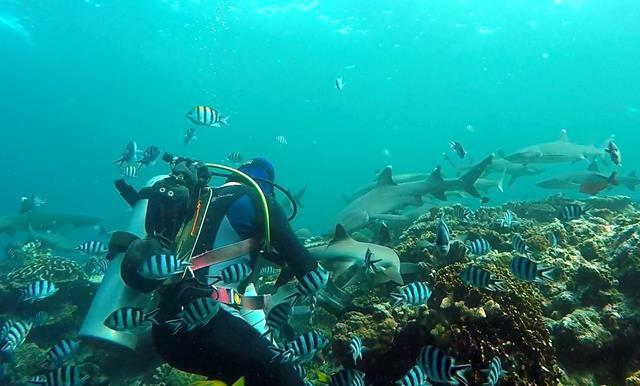 We visited during the Great Fiji Shark Count, a month where a country-wide effort is made to report the number of sharks seen on dives. It’s supposed to include all divers, but BAD was the only dive centre which actually asked us afterwards how many sharks we’d seen. For this dive, we took a boat over to Beqa Island at about 6.30am. We were hoping to see the elusive Tiger Shark (the biggest shark in these parts), but it was not to be. There were tons of fish here, which made it hard to see the sharks. It didn’t help that visibility wasn’t great. There’s actually a second diver in the picture below, but you can barely see him! 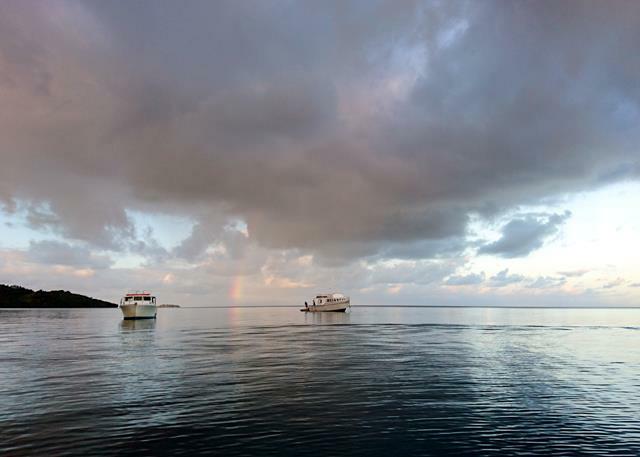 Price: FJD440 (USD210) for 2 dives (including boat transfers). It’s naturally cheaper if you’re staying at the resort! Overall, this dive was the most disappointing, as it was the most expensive and yet we didn’t manage to see a tiger shark. Some of Ian’s friends from Projects Abroad did actually see a tiger at this site, though. As always, no wildlife sighting is guaranteed, so I don’t blame the dive centre at all. We’d definitely be singing a different tune if a tiger had graced us with its presence! It didn’t help that the sea was somewhat choppy, so I was feeling seasick during the surface interval. I had bought motion sickness pills but was unable to use them for diving, as they were the type that causes drowsiness. Don’t make this mistake – check before you buy them! Hopefully this post has helped you to glimpse the majesty of these creatures. 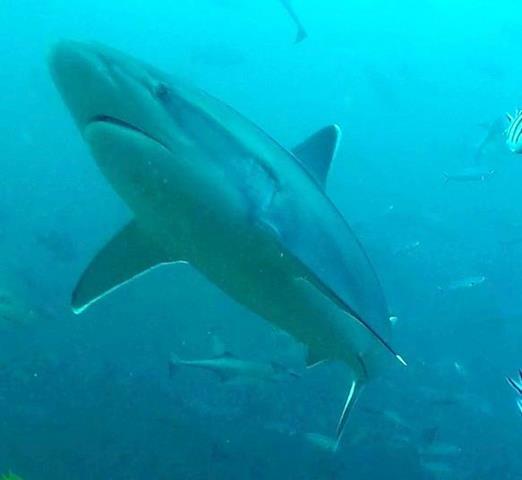 Check out my previous post on how we can all play a role in saving our sharks (and why it’s important) – even if you’re not a diver! Do you have a favourite shark or fish? You’re a lot braver than me. 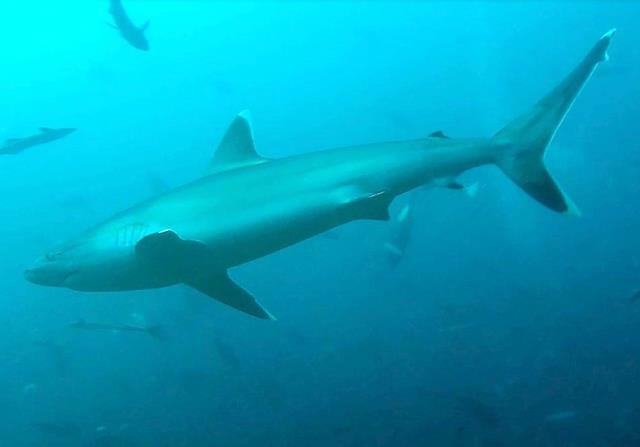 I have seen the odd reef shark when snorkeling and they always give me the shivers. I think the movie Jaws is largely to blame for how people view sharks (as well as reports of shark attacks – they do happen but they’re usually due to the shark mistaking the human for something else like a turtle). I think the common reef sharks (whitetips etc.) are much too small to even consider attacking humans – it would be unnatural for them to go for humans when there is much easier prey available, so I’m quite sanguine about it. Wow, Michelle! You are very brave. First of all I am afraid of diving because I am claustrophobic. Secondly, I am afraid of sharks. 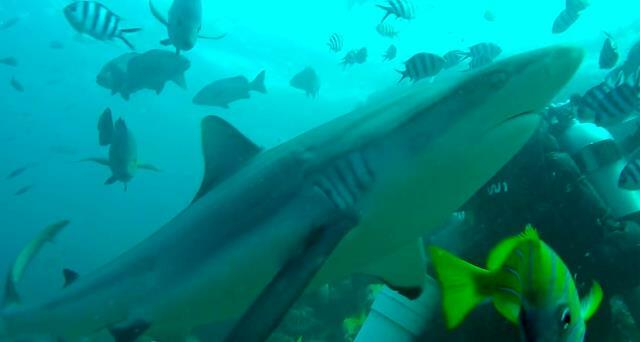 Even though I’m sure you were in no particular danger during the dive, it’s still scary to see these monsters up-close. 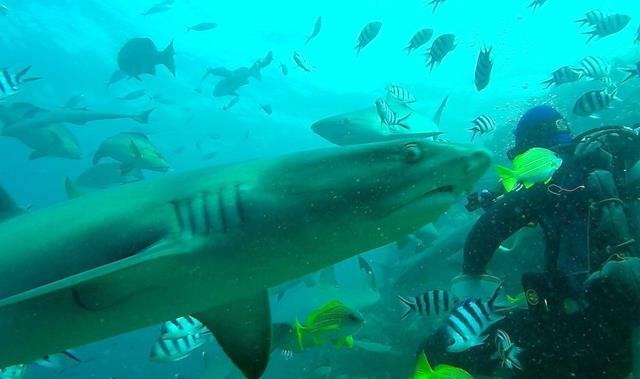 My husband, who is a diver, encountered many sharks during his dives, some of them quite big. Thanks, Anda! Diving is definitely not everyone’s cup of tea. I have friends who’ve tried to learn but just couldn’t get comfortable with it for various reasons. On the other end of the spectrum, I’ve also heard of people who can’t even swim trying to learn to dive (which is like trying to run before you can walk)! 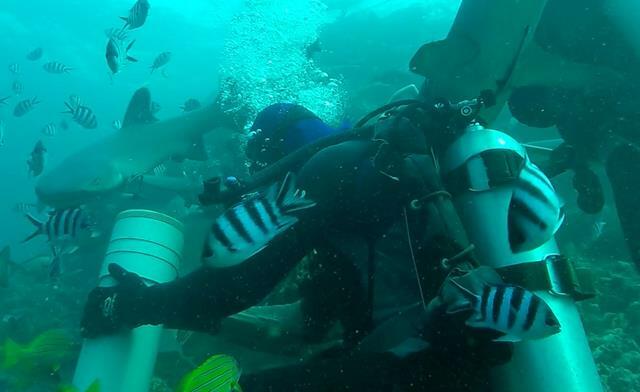 Some of the other guests on the shark dives were understandably nervous about safety as well, but I just personally figure that it would be highly unnatural for sharks to go after us if there are much easier prey (i.e. smaller fish) available! If you ever get the opportunity and manage to get comfortable with it after doing your due diligence (reading reviews, asking the dive centre questions, etc. ), I think it’s truly the experience of a lifetime 🙂 Thanks for stopping by, Lolo! But why do you think that feeding them helps with protection? You are obviously already a shark fan (as am I) so for your to go feed them does nothing to give them extra protection. You would still dive and write about your experience and hopefully raise awareness so I don’t see how the feeding helps? I think any sort of messing up the eco system like that or getting them too close to human is ultimately a bad thing. Does any of the proceeds from the feeding dives at least go back into shark conservation? Sorry, I hit send too fast! Definitely don’t do anything you aren’t comfortable with. Glad you enjoyed the photos anyway! Wow – those are some pretty impressive dives! I think you’re right about shark dives being (mostly) beneficial. It takes them out of the unknown and makes them something you’ve interacted with, something you have a history with, and understand. And people are much more likely to preserve that which they understand, even if only a little. That said, not sure I’m ready to be in the water with that many bull sharks! Yikes! “People are much more likely to preserve that which they understand, even if only a little” – well-put, Rob, and I couldn’t agree more! Yeah, it was a little hard to be impressed by the much smaller whitetips and blacktips after seeing the much bigger bull sharks up close 😛 thanks for stopping by!